If you’re looking for a pair to top-quality carbon grips, then these ones from Bear Komplex should be at the top of your list. They’re affordably priced and some of the best in the business. Read our buying guide packed with information to help you decide if the Bear Komplex Grips are right for you, and your next workout. Bear Komplex calls their hand grips the best on the planet. Although it’s quite a big claim, it may actually not be that far from the truth. They have a ton of features you’ll love and combine that the excellent customer reviews and you certainly have a winner. They’re lightweight, breathable and have extremely grippy, durable material. We’re reviewing the carbon grips, but the company also makes some excellent ones in leather as well. The biggest problem with this kind of product is that the stitching comes apart. However, the quadruple stitching on Bear Komplex grips makes them a cut above the rest. The vast majority of people mention that these are extremely durable and long-lasting. Maybe you go to the local gym or your favourite box and find that the bar is slick. Even worse, it may be a competition where results really matter. With these grips (or other workout gloves) you can stick to the bar, no matter what. You don’t even need chalk—they really are that grippy. When you’re lifting some heavy weight, or going for your personal best, the last thing you should be worried about are what’s on your hands and feet. You want to have a stable, flat platform with shoes that are grippy. And on your hands, you want something that will prevent the bar from slipping out of them. Free carabiner clip to make sure you don’t lose them at the gym. What Options are There for Bear Komplex Grips? If you’re looking for a top-quality pair of hand grips to use for gymnastics, weightlifting or CrossFit, then these Bear Komplex ones certainly make an excellent option. They’re very reasonably priced, but have a ton of features that you’ll love. The company really has thought about everything. The wrist strap is comfortable and won’t cut into your wrists. They include a carabiner to clip to your belt so that you won’t lose them between sets. 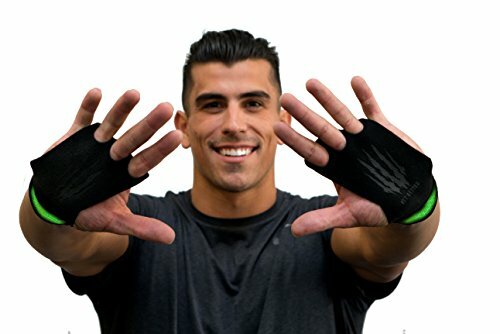 The material is grippy, but breathable and your hands will stay cool and comfortable during a workout. Along with these carbon grips, you can get them in leather. And then they come with the option of 2 or 3 finger holes. Some of the best hand grips in the world? Quite possibly, yes and they’re certainly a buy in our books! What are your thoughts about these grips that are ideal for gymnastics, CrossFit or weightlifting? Leave a comment below and let us know what you think.